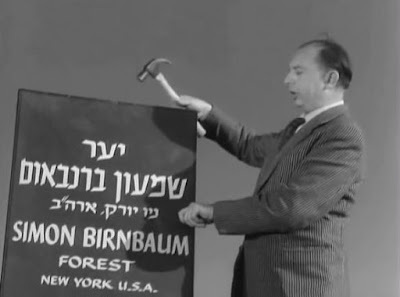 It's a 1964 comedy about the chaos of Israeli immigration and resettlement. This social satire placed the director Ephraim Kishon and producer Menahem Golan among the first Israeli filmmakers to achieve international success. It also introduced actor Chaim Topol (Fiddler on the Roof) to audiences worldwide. The film's name, Sallah Shabati, is a play on words; ostensibly a Yemenite Jewish name, it is also intended to evoke the phrase סליחה שבאתי, "sorry that I came". In earlier print versions of Kishon's short stories which were revised for the film, the character was known as Saadia Shabtai. The film begins with Sallah Shabati, a Mizrahi Jewish immigrant, arriving with his family in Israel. Upon arrival he is brought to live in a ma'abara, or transit camp. He is given a broken down, one room shack in which to live with his family and spends the rest of the movie attempting to make enough money to purchase adequate housing. His money-making schemes are often comical and frequently satirize the political and social stereotypes in Israel of the time. In this scene, appropriate for tomorrow's holiday of Tu B'Shvat, the new year of the trees, Sallah is working in a tree planting detail on a hillside in Israel. A government official plants a sign announcing the naming of a forest for an American donor couple just as they arrive in a taxi. After they take a few photos of their new tree and depart, the official plants a new sign with the name of another donor pair just as they arrive at the same spot. The movie is in Hebrew and there are no English subtitles, but the story line is obvious and easy to follow. Enjoy, and have a happy Tu B'Shvat!